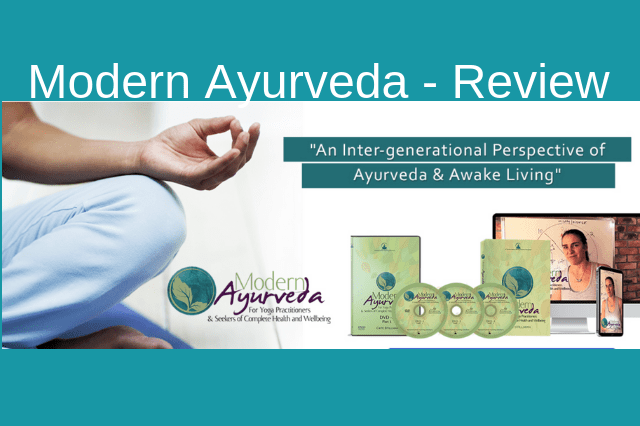 Modern Ayurveda Review – an online course that explains the traditions of Ayurveda from a modern perspective. Taught by Cate Stillman, it is designed to help you bring the teachings of Ayurveda into everyday life. 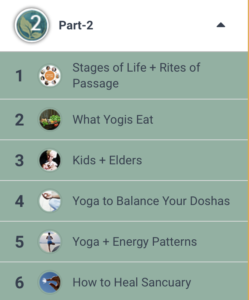 Module one lays some foundation by providing the meaning of Ayurveda and the best way to learn it. You'll get a direct experience of how energy, rhythms, and cycles work in your body and in nature. 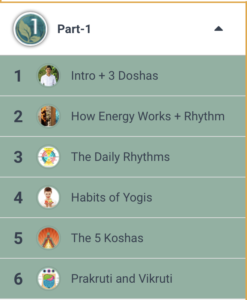 This module also explains the three doshas, Vata, Pitta and Kapha and how energy works within the different body types. Also covered are Koshas, which are the energetic layers that give us a framework for understanding ourselves. Also, Cate ends this module with a beautiful explanation of Prakruti & Vikruti. Prakruti is our innate constitution, and Vikruti is the nature of our imbalance. Module two continues with a deep dive into the stages of life from birth all the way to death and the rites of passages we use to mark them. The teachings here will help you optimize your journey through the different stages of life… Or to help you through a stage of transition or transformation. On the path of learning Ayurveda and Yoga you may find that you may make different choices about what to eat. Here Cate explores feeding yourself and explains that on any path to higher consciousness, it's best to consume food with a strong life force. 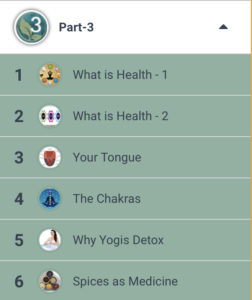 Module 3 begins with What is Health – Part 1 & 2. 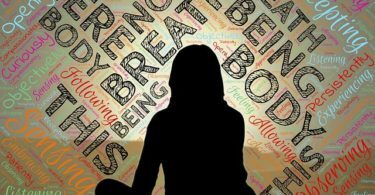 This section gives a new perspective – an Eastern perspective to examine who we are to give you an awareness of your mind-body connection. As you progress through this last module, you'll learn about tongue diagnosis – How to read your tongue to tell you about the health of your digestion. Next, Cate dives into the Chakras or energy centers. She walks you through each chakra so you can start to become aware of the subtle patterning in your mind and emotions. Next up, Cate explains why Yogi's detox with relationship to Ayurveda so that we can begin to shift our habits into alignment with who we want to be next. She finishes out this section with detox suggestions for each dosha, Vata – Pitta – Kapha. Module 3 ends with how to use spices as simple solutions to small imbalances so we're not forced to take toxic pharmaceuticals. 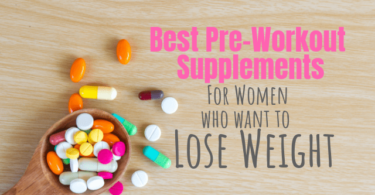 She includes many spices you already have in your spice rack and tea recipes to put you quickly back on track. your doshas get the most from your yoga practice. Module 2 ends with how to create a home healing space. Cate Stillman will give you exactly what you need, with simple how-to guides to heal your body and life. She is one bright light and you'll love her, and her teaching style within the first five minutes. There is an extensive amount of information about Ayurveda and Yoga. If you are interested in learning Ayurveda, this is the perfect entry level course. This course is very interesting and engaging with over 18 videos. The instruction is simple and you can put to use on day 1. Cate's teaching style feels like you have a 1:1 teacher in the comfort of your own home. She gives clear explanations and easy tips to help you integrate Ayurveda into your daily life. 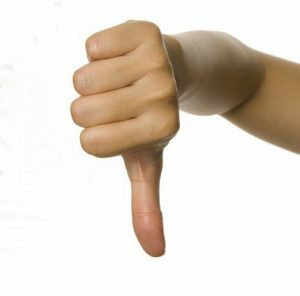 Modern Ayurveda may not be for you if you have strong religious views or a background whose teachings contradict the teachings of Ayurveda. The course is over 12 hours. There were 18 videos in the course. 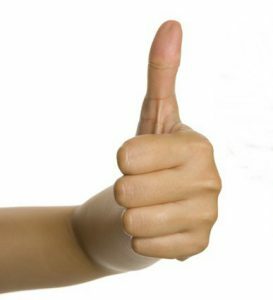 I would recommend pacing yourself when watching the videos since there is a lot of information to process. If you want to integrate Ayurveda into your life as a preventative lifestyle, you'll need to apply the information which will take effort on your part, but the results will be worth it! Cate Stillman is the creator of Modern Ayurveda. She is a Clinical Ayurvedic Specialist and also a graduate of Dr. Vasant Lad's Gurukula program in Pune, India. 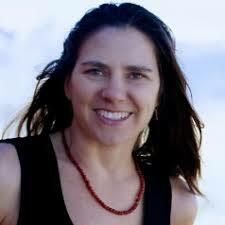 Also, Cate is a certified Anusara Yoga teacher and the founder of the Worldwide Association of Yoga Health Coaches. She also trains other people to be yoga instructors and wellness coaches in the Ayurvedic traditions. After completing the course, you get a free 172-page course summary book. You can use as a reference from this course. You also receive The Ayurveda Experience as a BONUS GIFT. I hope I have sufficiently covered anything you may want to know about Modern Ayurveda in this review. But, if you have further questions or comments, please do not hesitate to ask below in the comment area. This was new to me. I had no idea what Ayurveda even was. I had never heard of this product. Nor had I ever heard of Cate Stillman…? I’m still blurry on what these things are. They seem like a good product to buy. I like the segments you have listed. These segments make it very appealing.